This is one of the most often asked questions I get as a Tarot Reader. It is hard to move on without knowing the answer if we still love the one who left, even if we know in our minds that moving on is for the best. In some cases, when it’s clear that you have had a narrow escape, it might be better to suggest cord cutting rather than looking into if the abuser will be back… but in the end it’s not for the reader to judge. We all have free will and it is a well-known fact that many many people on this planet choose to live in co-dependent and/or toxic relationships. Sometimes relationships fall apart and we are quick to judge the other person, blaming the breakdown on them when really we know that it takes two and you are just as responsible as they for creating the dynamic you had and that led to the breakdown. If what you desire deep down is hidden behind a magic door, what would the door look like? What kind of lock would it have? What is the key like? Are you holding the key? What is the handle like? What does it feel like to push the door open and step through? Granted, if applied to the desire to reconnect with an ex, this implies that unlocking the door to an AWOL lover is in our control. We all know it isn’t as simple as that. However, the cards can give us clues about what we can and can’t do to reconnect in this situation. 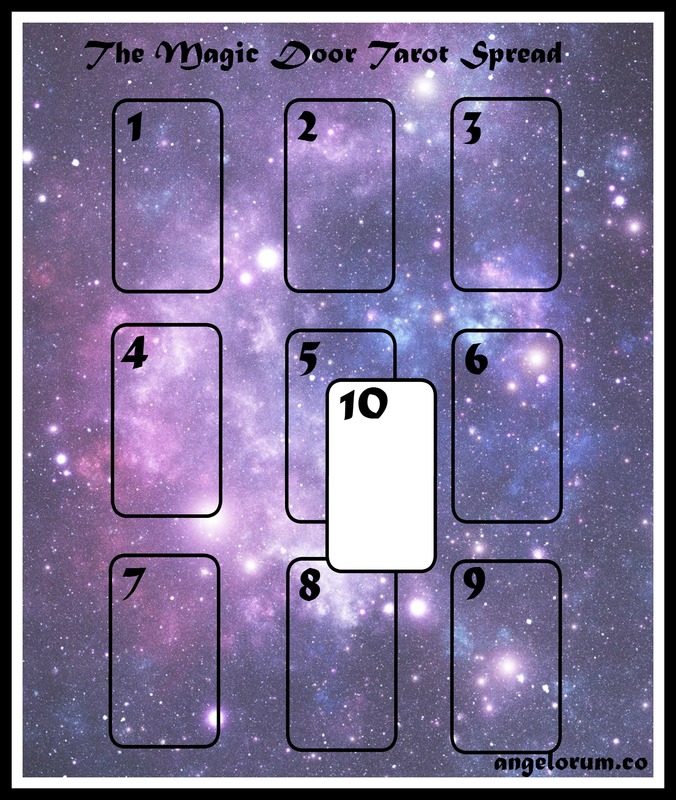 The Magic Door Spread truly is a magical spread in that it sheds light on all aspects of the desire to reconnect as well as the best way forward (if there is one). 1. Your motivation – The first card shows you the real underlying reason for your desire to reconnect. It indicates if you want them back to soothe a bruised ego or if there is true love there. It tells you if you feel that you didn’t learn all you needed to learn or if you are just struggling with letting go. 2. & 3. What you had – These two cards represent the relationship dynamic you had in the past and sheds further light on the first card. 4. The handle – This card shows you what action you would need to take to reconnect. A card such as The Hanged Man shows that it won’t matter what you do, you’ll just have to surrender and wait for the future to unfold. Look for the Fire (Wands+Majors) and Air (Swords+Majors) cards to indicate that taking action will pay off. 5. The lock – This is the main challenge/obstacle that lies between you and your AWOL lover. 6. An outside influence currently affecting the situation – No need to elaborate. 7. 8. & 9. What lies on the other side of the door – This signifies how things might turn out if you did get back together. 10. The key – If you received a green light for using that door handle, then this is the key that unlocks the lock and gives you the understanding you need to open the door.